Superior Flight Solutions L.L.C. is a combat veteran owned business, started by Greg Windmiller and based out of North Carolina that specializes in teaching, coaching and mentoring in several skydiving disciplines. Greg Windmiller joined the U.S. Army in 1990, right after completing high school in Brookhaven Mississippi. After Infantry training, he attended Basic Airborne School and was assigned to Long Range Surveillance Detachment (LRSD) in Korea. Upon returning to the United States, he was assigned to the 82nd Airborne Division's Long Range Surveillance Detachment, a unit that specialized in small group infiltration tactics while working in 6 man teams conducting reconnaissance and surveillance operations. Windmiller got his start in skydiving by attending the Special Forces Military Free Fall School at Ft. Bragg, North Carolina and later attending the Military Free Fall Jumpmaster Course. Windmiller was later selected to be an instructor at the Long Range Surveillance Leaders Course in Ft. Benning, Georgia. While assigned there he also participated as a member of the "Silver Wings" Ft. Benning's Command Exhibition Parachute Team. Windmiller attended the U.S. Army Parachute Team's Assessment and Selection in 2000 and was selected as a Golden Knight along with 8 others out of 29 participants. He started as a competitor and then Team Leader of the Style and Accuracy Team and later moved to the Tandem Team as the Assistant Team Leader for several years before co-founding the Canopy Piloting Team in 2007. In 2008, the first full year of competing in canopy piloting for the Golden Knights, the team saw much success as Windmiller finished the year ranked 3rd in the world at the World Championships in Johannesburg, South Africa and setting the first of 5 World Records in speed entering the course at nearly 90 miles per hour. Since 1996, Windmiller has been teaching skydiving and coaching canopy control. He developed his unique teaching style and techniques and began coaching professionally in 2007 as a weekend side job. He has worked with numerous Special Operations Units while assigned to the Golden Knights as part of his duties to give back to the war fighters and increase operational success. Greg Windmiller retired in 2016 with 26 years of distinguished service to our country. 100+ regional medals from competing in 4-way formation skydiving, 8-way formation skydiving, style and accuracy and canopy piloting. U.S. Army Parachute Team "The Golden Knights"
Matt is an amazing coach that brings a new dynamic to the Superior Flight Solutions team. Matt has shadowed all of the courses that Superior Flight Solutions offers and is well versed with his own coaching style. Matt began skydiving in March 2010 and fell in love with the sport immediately. While still in college, he won several medals in RW and sport accuracy at USPA collegiate nationals. Those experiences led him to look deeper into the sport for other areas where he could compete – then he found canopy piloting. Learning about the challenges of competitive canopy piloting led him to join Control Tower. 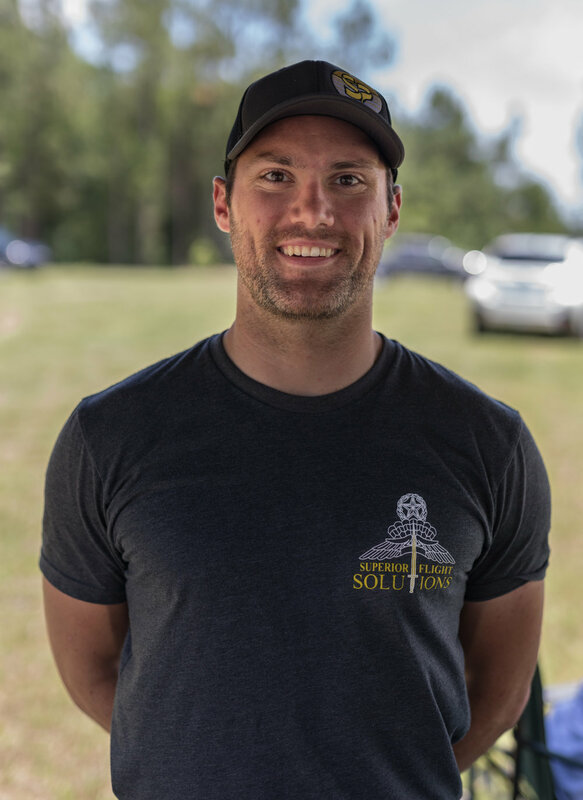 During his first year of competition, 2015, he won the USPA Canopy Piloting Nationals in the Advanced category, under Superior Flight Solutions. He is now focused on being a Pro Canopy Pilot on the world level and promoting safety and teaching with Superior Flight Solutions. He loves traveling to compete, pushing the limits of canopy flight, and learning more about what our sport offers in every discipline. Outside of competition, Matt enjoys teaching and consequently earned his Coach, TI, and AFF-I ratings then worked for several years as an instructor and S&TA at his home dropzone. Matt after becoming the US National Champion in the advanced class in 2015.